Planting new trees along the route to improve pedestrian accessibility and enhance the pedestrian experience. On top of the work to the Dexter Street thoroughfare, the project included essential repairs to the Dexter Street Bridge No. 935, enabling a structurally sound crossing over the Amtrak, Providence, and Worcester railroad lines. Repairs to Bridge No. 935 included the replacement of existing pavement and waterproofing membrane, repairs to the concrete backwalls, installation of new asphaltic-plug joints, replacement of the sidewalk joint sealant, and repairs to the concrete bridge sidewalks. 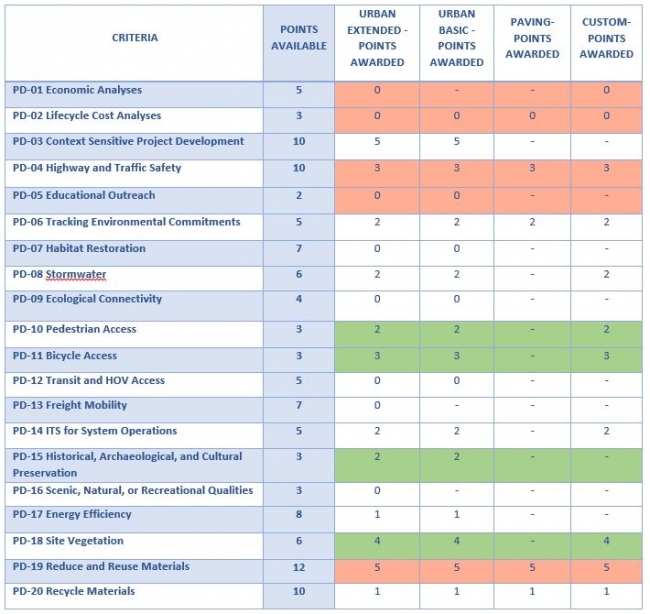 To better analyze the sustainability of the Dexter Street project, RIDOT chose to score the project against four of the available scorecards for the INVEST PD module: Paving, Basic Urban, Extended Urban, and a Custom scorecard. This approach was used to better understand how the project scored across multiple criteria in different categories. Overall, the project earned 32% of available points in both the Paving and Extended Urban groupings, and 34% of available points in the Basic Urban grouping. While achievement levels are not assigned for the Custom scorecard, RIDOT took the 11 required core criteria associated with the Custom scorecard, added nine additional criteria (PD-1, PD-8, PD-10, PD-11, PD-14, PD-18, PD-21, PD-31 and PD-33), and calculated a score of 40% for the grouping. The table below provides scores for the RIDOT Dexter Street and Dexter Street Bridge project for each of the scorecards mentioned above. 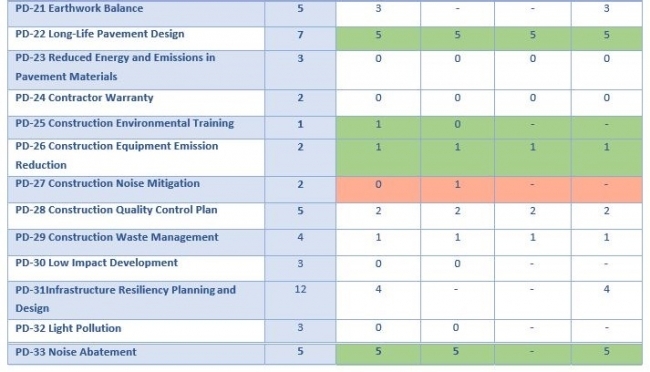 Criteria that RIDOT identified as high scoring are highlighted in green, while criteria RIDOT identified as needing improvement are shaded in red. Cells with a dash indicate criteria that were not evaluated under that particular scorecard. PD-11 Bicycle Access (3/3, Urban Extended, Urban Basic, Custom Scorecards). The purpose of this criterion is to determine whether projects provide safe, convenient, connected, and comfortable bicycle routes to citizens, within the scope of a project. RIDOT scored full points for this criterion for its installation of a designated bike lane on Dexter Street in Pawtucket and the addition of sharrows, or shared lane markings, on the Central Falls project section. These project elements ensure safer and more convenient bicycle travel within the project footprint. In addition, RIDOT installed “Share the Road” signage on Dexter Street from School Street to Congress Street. The new bike lane connects to an existing bike path in Pawtucket as well as to a future bike path that will be part of the Blackstone River Bikeway. This Bikeway is part of RIDOT’s 10 Year Plan for Federal Fiscal Year 2023. PD-25 Construction Environmental Training (1/1, Urban Extended Scorecards). This criterion helps agencies determine whether a project implemented formal environmental awareness training during the construction phase of the project with the goal of minimizing negative impacts to the natural environment. RIDOT earned a perfect score for this criterion as it provides formal training on its Stormwater Pollution Prevention Plan (SWPPP) inspection requirements and Soil Erosion and Sedimentation Control (SESC) plans to construction personnel each winter. As part of this training, RIDOT educates personnel on who is responsible for inspections, how to manage inspections, how often inspections must be conducted, which project locations are best for inspections, and how to ensure quality assurance. PD-33 Noise Abatement (5/5, Urban Extended, Urban Basic, Custom Scorecards). This criterion helps agencies assess how well a project reduces the impacts of traffic noise on the surrounding communities. RIDOT scored full points for this criterion for its careful consideration and mitigation of the effects of roadway noise pollution on areas surrounding the project. Specifically, RIDOT designed quiet pavements for the Dexter Street project, earning the agency full points. The newly designed pavement noise levels fall below maximum allowable levels laid out in the PD-33.4.A: Testing Speeds and Maximum Average On-Board Sound Intensity Noise Levels Table. This mitigation technique was essential to reducing the noise impacts on businesses and residents of the Dexter Street thoroughfare. PD-01 Economic Analyses (0/5, Urban Extended and Custom Scorecards). The goal of this criterion is to help agencies determine if the economic, social, and environmental benefits of a project justify the lifecycle costs incurred. RIDOT scored zero points for this criterion because it did not conduct a formal economic impact analysis (EIS) or a benefit-cost analysis (BCA) for the project. PD-02 Lifecycle Cost Analyses (0/3, Urban Extended, Urban Basic, Pavement, Custom Scorecards). This criterion is intended to assist agencies in reducing life-cycle costs and resource consumption of a specific project through the use of life-cycle cost analyses. The three sub-criteria include performing an LCCA for pavement structures alternatives, stormwater infrastructure alternatives, and major features. RIDOT did not earn any points for this criterion as it did not conduct any formal life-cycle cost analyses (LCCA) during the decision-making stage of the Dexter Street project. PD-05 Educational Outreach (0/2, Urban Extended and Urban Basic). The purpose of this criterion is to determine whether an agency incorporated public education on social, economic, and environmental sustainability into project planning stages to increase public awareness on the nexus of sustainability and transportation project development. RIDOT scored zero points for this criterion because it did not plan or host any educational meetings with the public on the Dexter Street project. Through the assistance of INVEST, RIDOT identified several new best practices and sustainability enhancements/improvements it can draw upon when planning, designing, and constructing future projects. In fact, many of the criterion points that the Dexter Street project was unable to earn through this evaluation can be easily achieved in future projects with only slight alterations to current practices. RIDOT shows a clear dedication to ensuring sustainable project development and execution, and as a result of its INVEST analysis, it is able to move forward with the tools and resources it needs to accomplish this goal. To improve future INVEST analyses, RIDOT intends to identify a desired minimum score it hopes to earn for all sustainability criteria. This will enable the agency to determine whether its project development processes are below, at, or exceed expectations. For those criteria where RIDOT did not achieve high scores, the agency plans to seriously consider steps to improve its performance, whether that means conducting a formal LCCA, EIA, and BCA or determining the optimal level of educational outreach for roadway projects on a case-by-case basis. INVEST allowed RIDOT to identify areas of economic, social, and environmental sustainability that it was not aware were missing from its project development process. INVEST allowed managers and designers to look beyond the immediate project design and consider how a project can be part of the community and enhance transportation while minimizing impacts on natural resources. INVEST highlighted the benefits of incorporating sustainable practices as early as possible in the project development process. By planning early, key sustainability best practices can be incorporated into the project with limited barriers.